by Chris Woodford. Last updated: April 8, 2018. Now here's a bright idea—a lamp that saves you money and helps the environment! It lasts 10 times longer than a standard electric lamp and uses 80 percent less energy. If you care about tackling global warming, lamps like this are a great place to start. During its lifetime, a typical energy-saving lamp will stop about one ton of carbon dioxide from entering the atmosphere and pay for itself many times over. So it's good for your pocket and kind to the Earth as well. There are two quite different kinds: CFLs (compact fluorescent lamps) and LED (light-emitting-diode) lamps. What's the difference between them, how do they work, and which is best? Let's take a closer look! 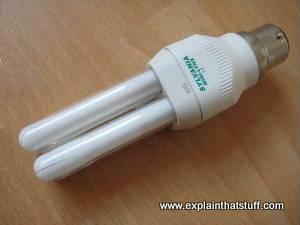 Photo: A typical energy-saving compact fluorescent lamp (CFL). Light comes from the twin fluorescent tubes on the left. 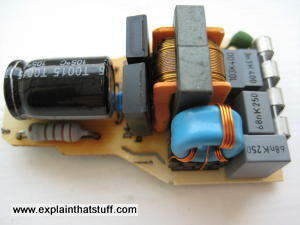 The cube-shaped base of the lamp contains a transformer and other electronics, as explained below. To understand what's so good about energy-saving lamps, we first need to understand what's so bad about ordinary ones. Photo: An incandescent lamp makes light when the filament gets white hot. It's hard to see this normally since you can't look at a lamp for very long without it hurting (or even damaging) your eyes. But this short exposure photo makes it clear exactly what's happening. Most lamps are incandescent. This means they give off light because they are hot. A typical electric light bulb is a glass globe with a very thin piece of wire inside it. The thin wire, called a filament, gets extremely hot when electricity flows through it. Now, hot things often give off light. Fires, for example, look red, orange, yellow, or white because they are hot. Put an iron bar in a fire and it will glow red when the temperature reaches about 950°C (1750°F); this is what we mean by "red hot." If the temperature rises to about 1100°C (2000°F), the bar glows yellow. If it gets hotter still, say about 2500°C (4500°F) it will glow with a bright, white light. 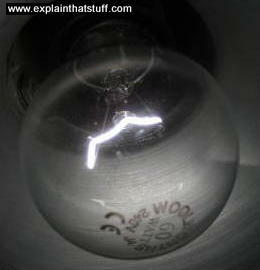 The filament in a lightbulb looks white because it is glowing white hot. Hot iron looks red, yellow, or white because it is giving off light—but why should it give off light at all? When you heat iron, the atoms inside it absorb the heat energy you supply. The electrons inside the atoms push out farther from the nucleus to soak up this extra energy. But this makes them unstable, so they quickly return to their original or "ground" state. When they do so, they have to get rid of some energy and do so by giving off a tiny packet of light called a photon. Depending on how much energy they get rid of, the photon appears as light of a particular color. See our article on light for a fuller explanation of how atoms make light. You might think heating up a bit of wire is a pretty inefficient way to make light—and you'd be right. A fire, a hot iron bar, and the wire filament in a lamp all give off light, but they also give off heat. If making light is our only objective, any heat we make is wasted energy. If you've ever put your hand near a typical incandescent lamp, you'll know it gets incredibly hot—far too hot to touch, so don't try it! In fact, an incandescent bulb wastes about 90 percent of the electricity it uses by getting hot. Traditionally, energy-saving lights save energy by making light without the heat using a completely different process called fluorescence. This is a trick similar to the one used by creatures like fireflies and glow-worms, whose bodies contain chemicals that make "cool light" without any heat. The general name for light made this way is luminescence. You plug the base into the power outlet. Just inside the base, where the case widens out, there's a small electronic circuit, containing a transformer, that boosts the voltage of the incoming electricity. (You can see a photo of the circuit below.) This means the lamp can produce more light than it would otherwise do and also helps to reduce flicker. The circuit is connected to a couple of electrical contacts called electrodes. When electricity flows into the electrodes, electrons (shown here as red dots) boil" from their surface and shoot off down the thin white tubes, which contain mercury gas, shown here as bigger blue dots. As the electrons hurtle down the tubes, they collide with atoms of the mercury. The collisions give the mercury atoms energy so their electrons jump to higher energy levels. But this makes the mercury atoms unstable, so the electrons quickly return to their ground states. When they do so, they give off photons of invisible ultraviolet light (slightly higher frequency than the blue light we can see), shown here as a purple wiggly line. If fluorescent lights make invisible light, how come they glow white? Here's the clever part. The thin glass tubes of a fluorescent light are covered in white-colored chemicals called phosphors. When the ultraviolet light strikes atom of the phosphors (shown here as gray dots), it excites their electrons in just the same way that the mercury atoms were excited. This makes the phosphor atoms unstable, so they give off their excess energy as photons—which, this time, happen to be visible, white light (indicated here with yellow wiggly lines). Photo: The electronic circuit inside an energy-saving lamp. The transformer is the big orange/gold thing in the center. The black cylinder on the left is a capacitor. The four silver colored contacts on the extreme right are where the electrodes attach. 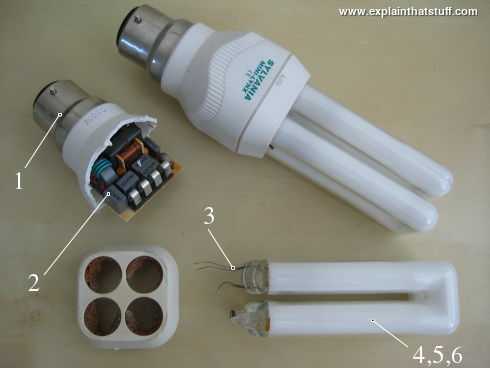 What's inside a compact fluorescent lamp? In case you're wondering, here's what a compact fluorescent light actually looks like inside. (Don't break one apart yourself; there is some health risk from the mercury inside if you smash those white glass tubes.) Sorry the photo is a bit blurred. Next time one of my lamps breaks, I'll take a better photo! Energy-saving fluorescent lamps are far better than incandescent ones, but they still have their drawbacks. As you can see from the photo up above, there's lots of electronic circuitry inside them and that's hard to recycle at the end of their life, so most lamps like this end up in landfills. The mercury inside them is toxic, so if you break a bulb inside your home, there's a small risk to your health (and the mercury pollutes the landfill as well). Just as incandescent lamps have gone the way of the dinosaurs, CFLs are destined to follow: in February 2016, leading maker General Electric announced that it would stop making and selling CFLs in the United States in favor of LED lamps. It's now possible to buy LED equivalents of most incandescent and CFL bulbs, including small strip lights, so there's no real reason not to opt for LEDs straight away. 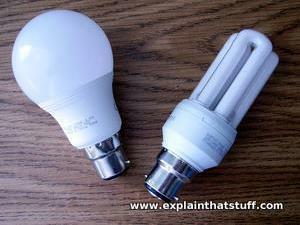 Photo: A typical LED lamp (left) looks much more like an old incandescent lamp than its older CFL rival (right). Since compact fluorescent lamps started to become popular in the mid-1990s, better alternatives have emerged: LED lamps. They're even more energy efficient, last quite a bit longer, contain far fewer electronic components, and don't contain toxic mercury, though, for the moment at least, they can be more expensive to buy. Another big advantage is that they reach maximum brightness almost instantly, unlike CFLs, which take several minutes to "warm up." LED lamps contain 10–20 so low-power, low-voltage light-emitting diodes and some circuitry to make them work off the higher voltage of the domestic supply. Many have a frosted outer plastic case or "diffuser" to spread the bright, highly directional flashlight glare of their little LEDs into a warmer, fuzzier glow more suitable for home lighting. One LED would normally run off something like a 1.5-volt DC (direct current) battery: a lot of modern flashlights work exactly this way, with a handful of LEDs powered by a couple of small batteries. A household lamp has some extra complications: the voltage is much higher (110–250 volts) and it's AC (alternating current) instead of DC. So, just as in a CFL, we need some circuitry to make our LEDs work properly. Diffuser: Individual LEDs have lenses built into them at the top so they fire their light in one direction. Put 10–20 of them together and you get quite a glaring beam—like an oversized flashlight. That's why most LED lamps have diffusers in them, which are typically frosted plastic domes that spread the LED beams into a fuzzier, more even glow, sending equal light in all directions. 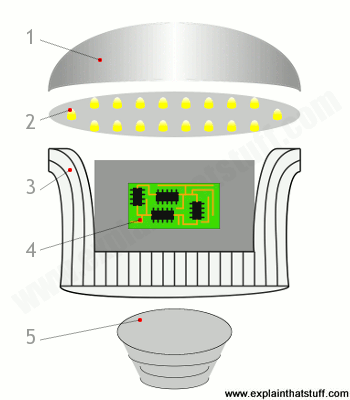 LED array: There are one or two dozen LEDs in a typical bulb. Heat sink: Although LEDs are energy efficient, they (and the circuit underneath them) still generate quite a bit of heat. Because the lamp is a completely sealed unit, all that heat would soon build up and damage or destroy the components inside. That's why LED lamps typically have ridged "heat sinks" (like the vanes of a radiator) to cool them down. Circuit: A transformer and a few other components convert high-voltage domestic AC to DC power for the LED array. Base: Usually either a screw-in (Edison screw, ES) or bayonet fitting. How can you compare the efficiency of different kinds of lamps? It's easy to pick up lamps in a store and fall for simple arguments on the box like "Uses 90% less energy" (less than what? "), "lasts 15 years," or whatever it might be, but when it comes to efficiency, we need to compare like for like. An incandescent bulb might be brighter than a CFL, for example, so is a straight comparison of energy use really that fair? One way to compare lamps is by looking at how much energy they need (measured in watts) to produce the same amount of brightness (measured in lumens). Dividing these two numbers, we get the number of lumens each lamp can produce for a single watt of energy. 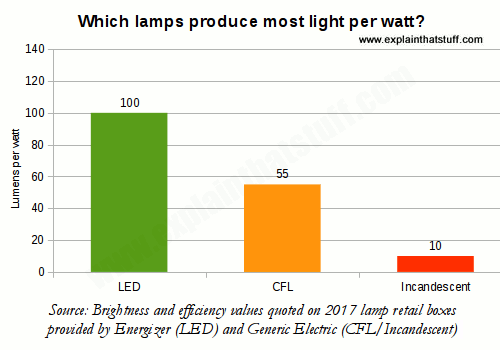 Looking at the chart here, you can see that LEDs are considerably better than CFLs on this measure, which are in turn much better than incandescent lamps. Chart: Lumens per watt: LED lamps are almost twice as efficient as CFLs when you factor in brightness. On the same measurement, CFLs don't look quite as good compared to incandescents (only 5 times better). LEDs are 10 times better than incandescents. You'll sometimes hear it said that modern CFLs are harsher and whiter than old-fashioned incandescent lamps, though that's not necessarily the case. If you buy your CFLs from a grocery store or supermarket, there's not much choice beyond the screw type and watt rating; you probably just pick up whatever's there without thinking about the color of the light. But if you go to a specialist lamp retailer (in person or online), you'll find you can buy CFLs in different "color temperatures," sometimes (depending on the manufacturer) indicated by a three-digit code on the box. So, for example, you can buy a Philips 10-watt CFL with a color temperature of 827 (extra warm white—quite a reddish, cosy light, good for ambient light in a home, bar, or hotel), 830 (warm white—a yellower light), 840 (ordinary white—a general-purpose white light, more suitable for reading at home), or 940 (cool white, perhaps more suitable for an office). 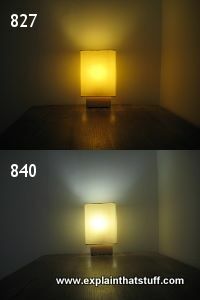 Changing the color temperature of your lamps will make a big difference to the ambience of your room. Photo: Color temperatures: This is one of my table lamps with two different color-temperature bulbs photographed under identical conditions. The photo doesn't really do justice to how much difference there is between a warm white (827) and a much cooler white (840). How much do energy-saving lamps actually save? You often hear people say that lamps like this pay for themselves quite quickly, but is that really true? Let's crunch the numbers and find out! Suppose you buy an incandescent lamp rated at 100 watts and it lasts for 1000 hours. In its lifetime, it will use 0.1 kilowatts (100 watts) × 1000 hours = 100 kilowatt hours, which is equivalent to 100 units of electricity or 360 megajoules. If you're in the USA, electricity might cost you 15–20 cents per kilowatt hour, making the total lifetime electricity cost around $15–20. (If you're in the UK, electricity would cost you probably 15–20p per unit, making the total lifetime cost of electricity £15–20.) A quick look around online reveals that you could buy a packet of 10 energy-saving lamps for that price. So it would take only 100 hours' worth of electricity to buy one equivalent, energy-saving lamp. For the sake of easy math, let's say an energy-saving lamp equivalent to an old-style 100 watt lamp uses 20 watts and lasts for 10,000 hours (so it will use five times less electricity and cost only a fifth as much to run). For every 1000 hours that it runs, it will save you 80 units of electricity. Ten lamps running for 1000 hours will save you 800 units of electricity or roughly $120–160. In other words, switching to low-energy lamps is definitely a no-brainer: they easily pay for themselves. Should you wait till your incandescent lamps stop working before changing over? No, change them straight away: there is no benefit at all to keeping them. What about switching from CFLs to LEDs? That's a slightly different case. Although LEDs are more efficient than CFLs, the difference is smaller and it's probably better to let your CFLs wear out naturally before replacing them (unless you particularly favor the instant brightness of LEDs). Light by David MacKay. This short chapter from David's excellent book Sustainable Energy Without the Hot Air explains the science behind home lighting, concluding that you should switch over immediately because "continuing to use an old lightbulb is throwing good money after bad." American households use a variety of lightbulbs as CFL and LED adoption increases: Today in Energy, US Energy Information Administration, 8 May 2017. Most US homes are now switching to energy-efficient bulbs, but take-up of LEDs is still relatively low. New Reasons to Change Light Bulbs by David Pogue. The New York Times. March 20. 2013. A good review of the latest LED lamps. There's also an interesting follow-up, Addressing Fears About LED Light Bulbs, where David Pogue responds to reader feedback. How Long Did You Say That Bulb Would Last? by By Eric A. Taub. The New York Times. February 11, 2009. Can an LED lamp really last 25,000 hours? Fluorescent lamps go green by BBC News, January 1999. Explains efforts to develop safer, mercury-free fluorescent lamps. How it Works: Fluorescent Lamp by Merle Henkenius, Popular Science, October 1991. Explains the workings of a fluorescent strip lamp. All About Fluorescent Lighting by Evan Powell, Popular Science, August 1975. An old but nonetheless interesting article about the general principles of fluorescent lamps.